Los autores de este libro, con isbn 978-84-8323-870-7, son Caroline Nixon, Kirstie Grainger y Michael John Tomlinson, esta publicación tiene ciento treinta y seis páginas. Esta publicación está editada por Cambridge University Press. Fue fundada en 1996 y tiene su sede en Madrid. El catálogo de esta editorial asciende a más de cien textos. Esta editorial está especializada en Libros De Texto De Inglés. El fondo editorial de Cambridge University Press se distribuye en colecciones como Gramática, Lecturas Graduadas y Diccionarios. En dicha editorial han publicado textos Peter Lamont, Charles Tripp, Paul Edmondson, Stanley Wells y Rebecca Cassidy. Otros libros de Tomlinson, Michael John son Kid's Box For Spanish Speakers 3: Activity Book With Cd-rom And Language Portfolio, Kid's Box For Spanish Speakers 3: Pupil's Book, Kid's Box For Spanish Speakers Level 4. 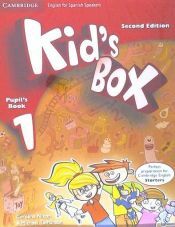 Pupil's Book, Kid's Box For Spanish Speakers Level 4. Activity Book With Cd Rom And My Home Booklet, Kids Box For Spanish Speakers 4 : Class Audio Cds, Kid's Box For Spanish Speakers 4: Flashcards, Kid's Box For Spanish Speakers Level 6 Pupil's Book y Kid's Box For Spanish Speakers, Level 6 Activity Book With Cd Rom And My Home Boo. .
Otros libros de Nixon, Caroline son Kids Box For Spanish Speakers, Level 2 : Wordcards, Kids Box For Spanish Speakers, Level 1 : Flashcards, Kids Box For Spanish Speakers, Level 2 : Flashcards, Kid's Box For Spanish Speakers 4: : Wordcards, Kid's Box For Spanish Speakers 3 : Flashcards, Life Adventures. Pupil's Book. Level 2, Life Adventures Level 3 Pupil's Book y Life Adventures Level 1 Teacher's Book. .
Otros libros de Grainger, Kirstie son Team Up! 5 Pupil's Book Pack y Kid's Box For Spanish Speakers Level 2 Pupil's Book With My Home Booklet 2nd Edition.